You have probably seen this optical illusion at least once in your life, but did you know that it could reveal how old you are? The image is called “My Wife or Mother-In-Law” and first showed up in 1888 on a German postcard. It was redrawn by a British cartoonist in 1915. So, what do you see in the image below? Do you see an older, unattractive woman or a young woman looking away? One version of the optical illusion is an old woman with a pointed chin and a hooked nose. She looks toward the left. The other version is a young woman looking into the distance. While you can easily train your eye to see both versions, the version you see first and more often can reveal a lot about your age. According to a study that was published in the journal Scientific Reports, younger people saw the young woman at first and older people saw the old woman at first. They showed “My Wife and My Mother-In-Law” illusion to around 400 people between the ages of 18 and 68. They showed these people the illusion for only a half a second. Do you agree with the results of this study? If you are interested in seeing both versions of the optical illusion, here’s how to see both. Look at the images side by side. If you look at the picture, the younger woman’s ear and the older woman’s eyes are the same. The older woman’s lips are the younger woman’s necklace. 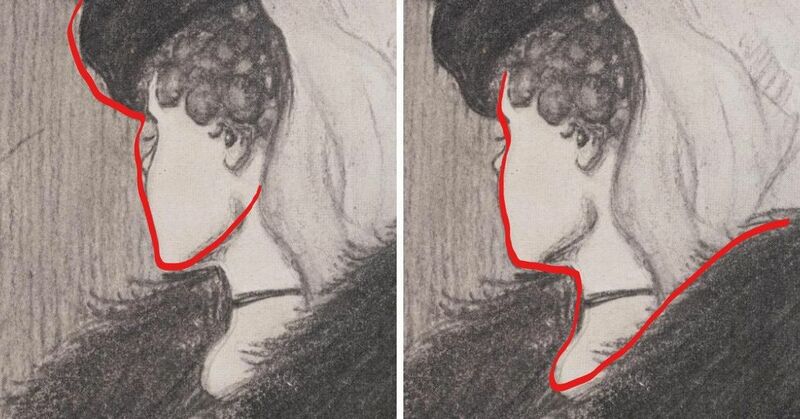 The younger woman’s face is the older woman’s nose. The study said that we process faces that are more similar to our own ages. It makes sense that young people may see the young woman in the picture and older people might see the old woman. People tend to have a bias with others their own age, so this optical illusion may prove this bias. What do you think about this study? What do you see when you look at this optical illusion? Do you think it reveals anything about your age? If you found this interesting, please SHARE with your friends and family of different ages to test this theory about optical illusions. The fantastical 19th century optical illusions that made pictures move: Click “Next Page” below!